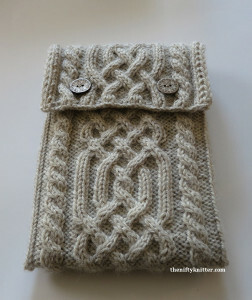 I wanted a soft case for my iPad mini, and I have always loved celtic knots. 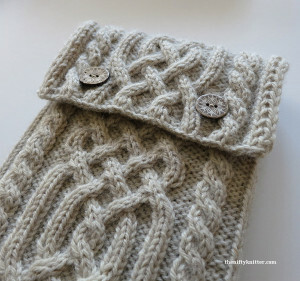 Knitting lends itself quite well to create celtic knots with cables, so thus the Celtic Mini Tablet Case was born. It is a nice thick case that will protect against scratches. Solid colored yarns show off the celtic pattern quite nicely. This case is designed for an iPad mini, with a finished size of 6” by 8.5” (15.24 cm by 21.6 cm). 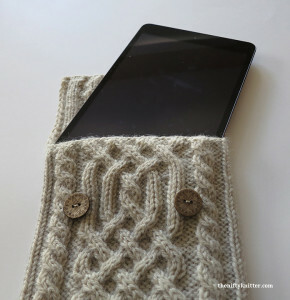 It should accommodate smaller tablets with a bit of extra space inside and slightly larger tablets with some stretch. 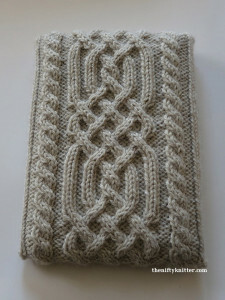 Types of stitches required: knits, purls, cables, increases, decreases, slipped stitches. Approximately 140-160 yards of worsted weight yarn. 2 approximately 0.75-inch (19mm) diameter buttons.